A combination of function, good looks, and value, this rack fits on the fireplace hearth and holds up to two dozen medium-sized logs. Can you tell me the dimensions? This rack measures 17.5" long by 13" wide and 19" high. .
Where are these hearth racks manufactured? Enclume manufactures almost their entire product line, including this product, in their facility located in Port Hadlock, WA. Solidly built and easy to assemble. Good capacity to boot! The hearth rack seems to be made very well with a nice finish that can be refreshed with a wax based cleaner like Pledge. We purchased this nice rack from the picture on the web site. When it arrived I had it assembled in no time at all. We were happy with the simple design and was even happier with how much wood you could load in the cradle. Well thought out color as well as its heavy duty construction. Great product. Solids construction. Perfect size to fit on the hearth. Highly recommended. Other hearth racks that I have had were not durable and broke quickly. They looked fancy, but they were of poor quality. This rack is very strong and holds a surprisingly large number of logs. I would definitely recommend it to anyone. We purchased this rack to match a Uniflame Toolset. We placed them on either end of the hearth, and they go together very well. This rack is just the right size. It is neither overly large nor too small to be of use. It seems to have good quality and the style fits well with modern decor. The company also provided very good service. At our cottage in Maine, it is not uncommon to have several days in a row of rain. We needed a hearth rack that would hold enough logs to last for a couple of days. This one does the job perfectly. It doesn't need a lot of space and blends very well with our wood stove. It is not overly fussy nor does it pose an obstruction in the walkway. We are very happy with this rack. 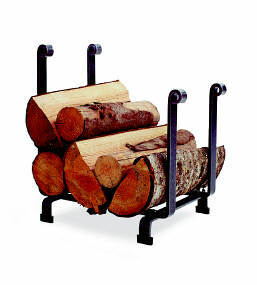 I am very pleased with the quality of this log rack and would most definitely purchase it again. It is built from heavy iron, so it is quite sturdy and long lasting. The metal color is unobtrusive, and it has a classic style. It is not overly wide, and its solid build allows you to stack the wood above the frame. I expect to be using this rack for many years to come. This rack is made of real iron, so it is strong while looking nice. The quality is very impressive. I am well satisfied with my purchase. This log holder was very simple to put together. I accomplished the task in under ten minutes. It goes quite well with the stone fireplace and is durable with a sturdy, iron design. It holds just the right number of logs for an evening fire. I searched for a while before choosing this particular holder, and I am very glad I did. This wood rack is exactly what we were hoping for. We are very pleased with its size and usefulness. I really like this rack. It is quite sturdy, but it also very compact. It definitely has my high recommendation. This rack has a really nice shape that enables it to hold a good amount of wood. It is built well and is just the right size for my hearth. It is nice to have the wood handy for my evening fire in the wood stove.